It's widely known that the national murder rate has gradually fallen from 9.8 per 100,000 living in 1991 to 4.7 in 2012. Some common explanations for this are the decrease in atmospheric lead level, the increase in the incarceration rate, the delayed effect of the legalization of abortion, advances in medical science, and fraudulent crime reporting. I don't believe the last two because robbery and assault rates have fallen by roughly as much as the murder rate, and crime statistics are gathered by thousands of local police departments, making widespread coordination of reporting fraud highly implausible. So for whatever reason, crime started falling nationwide after 1991. Millions of upscale Americans had always dreamed of living in NYC and two or three other prestigious cities, but in the 1970s and 1980s crime prevented them from realizing such dreams. The 1990s fall in crime made their New York fantasy easier to achieve. This quickly translated into rising real estate prices in NYC, which pushed a lot of downscale people out of the city, which decreased the local crime rate even further, which attracted even more upscale people to New York, which priced out even more downscale New Yorkers. A virtuous (for New York) circle was created. The NYC murder rate ended up falling not in half, like the national rate, but from 30.9 in 1990 to 4.0 in 2013. 1). The percentage of kids born to Black mothers peaked in 1986 at 31.99%. It has fallen in every single year since then, reaching 20.09% in 2012. 2). The percentage of kids born to Hispanic mothers peaked in 1995 at 33.29%. It was 29.73% in 2012, lower than in 1987. This is a huge country, so one could probably find some other cities in it where the Hispanic population is lower now than it was in 1987. Not many though. The nature of the local Hispanic population has changed drastically. The number of kids born to Puerto Rican mothers fell by more than half (from 19,327 in 1990 to 8,988 in 2011), while the number born to Mexican mothers has more than doubled (from 3,045 in 1990 to 7,704 in 2011). Where did all those Puerto Ricans go? Orlando and the Poconos. 3). 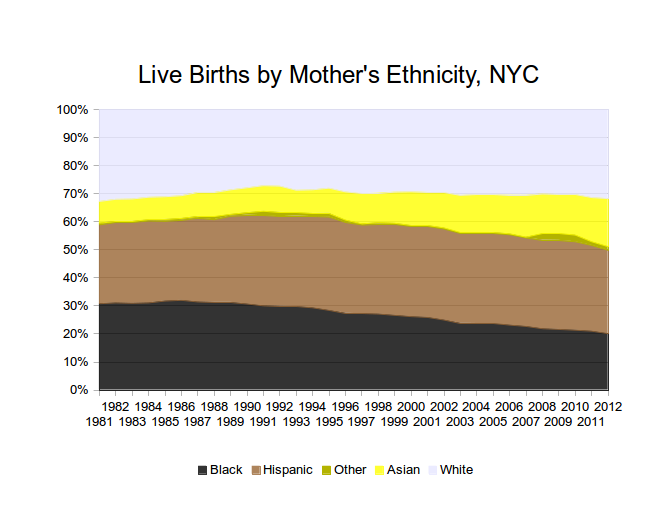 The stability of the percentage of kids born to White mothers is deceptive. Lower middle and middle middle class Whites have left the city in huge numbers while upper middle and upper class Whites have moved in. The Hasidic population has skyrocketed by natural means. 4). The "sun people" (Blacks, Hispanics and others) reached a peak in 1991 at 63.76%. They're now at 51.1%. Their decline accelerated during the last few years. Why did I include others among the sun people, you ask? Because their childhood mortality rate, as shown by vital statistics reports, is closer to those of Blacks and Hispanics than to those of Whites and Asians.